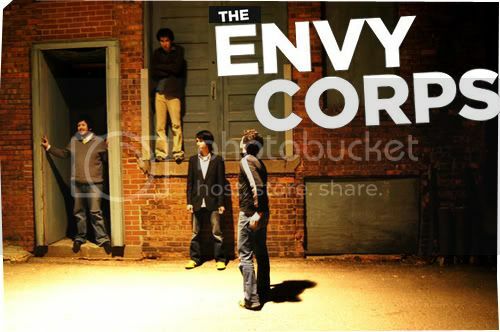 The Indie rock Iowa-based group, the Envy Corps’s music has been repeatedly compared to the likes of Radiohead and maybe with a bit of Scotland’s Travis thrown in. Rightly so, though the comparison can only be held for so long; Envy Corps may lack the grittiness and the heavy rigor that anchors the tunes of British rockers, Radiohead, or the smooth fluency of Travis’ works, which works to Envy Corps’s best advantage anyway, proving that the band are unprecedented music inventors in their own right. These guys are fast growing into one of my latest obsessions; strewn throughout the course of their latest offering, Dwell, is a stream of anthemic hooks propelled over impressive keys and sharp, pulsating melodies. Majority of tracks are shaped into radio-friendly forms, and yet there’s nothing sickeningly generic about any of them. Commencing the record, is the welcoming vocals that, instead of supposedly reminding me of Thom Yorke’s, sounded unmistakably similar to Rufus Wainwright’s vocal contours, before bursting into a barrage of blaring, and catchy, rhythmic swirls in ‘Wire and Wool’. Lead single ‘Story Problem’, is another tune worth taking heed of, recently selected as one of the soundtracks to the Simon Pegg written comedy, ‘Run, Fatboy Run’, it unfurls an outpouring sequence of steady guitar lines and euphoric synths, before decelerating to an infectious sing-along refrain. This is a quietly heroic record, a pop album bursting with art-rock hooks that are, for once thankfully, completely absent of cynicism or any hints of that tiresome, skinny jeans aesthetic. Here, finally, we have a sprawling, altruistic record, one built by championing honesty and substance while completely ignoring style. This is not a hip record in any sense, but it is surely refreshing, a Coldplay for those who hate Coldplay but still fall for sweet melodies regardless. Simple: this is real, truthful music.